Designed for young men, Program H encourages critical reflection about rigid norms related to manhood and encourages transformation of stereotypical roles associated with gender. To develop the Program H curriculum and approach, Promundo carried out household surveys and qualitative research with young men showing more gender-equitable attitudes and determined critical factors in helping boys and young men adopt similar attitudes and behaviors. Partners around the world have since adapted these activities based on local research findings. 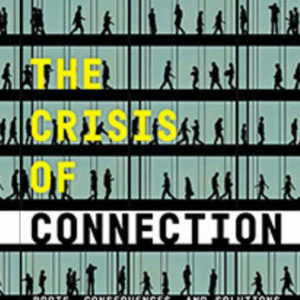 Evidence-based group education activities such as role-playing and discussion of important issues help change attitudes, adjust coping mechanisms, and introduce healthier ways to deal with conflict. 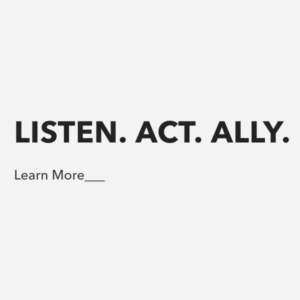 Youth-led campaigns encourage supportive peer groups, engage young people, and reinforce specific social changes in a community. Program H is named after homens and hombres, the words for men in Portuguese and Spanish. 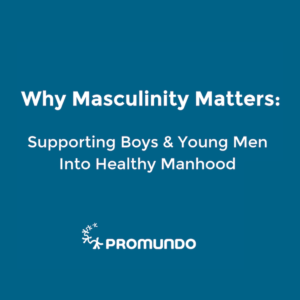 Launched in 2002 by Promundo and partners and now used in more than 34 countries, it primarily targets young men, ages 15 to 24, to encourage critical reflection about rigid norms related to manhood. It is based on extensive research of young men in Brazil with more gender-equitable attitudes. This research demonstrated that these attitudes were more prevalent men who had a peer group supportive of gender equality, had personally benefitted from gender equality in some way, and had more meaningful male role models. The Program H methodology promotes group education sessions combined with youth-led campaigns and activism to transform stereotypical roles associated with gender (such as prevalence of contraceptive use or distribution of household responsibilities). To complement these activities, Promundo offers a conversation-starting, no-words video Once Upon a Boy. Organizers can choose from some 70 validated Program H activities to customize the program for the needs of their communities. They can also utilize the Program HMD Toolkit, an abbreviated manual that includes recommendations for the implementation of different modules. Partners usually implement 10 to 16 activities, once a week, over a period of several months in conjunction with community awareness campaigns created by youth themselves. As organizations deploy Program H in their communities, they can use its innovative Gender Equitable Men (GEM) Scale for evaluation before and after interventions and campaigns to assess their effectiveness. The GEM Scale is a validated attitude scale that has been adapted and applied in more than 20 settings and has shown to be highly useful as an instrument to assess attitudes about gender. After participating in Program H activities, young men have reported many positive changes, from higher rates of condom use and improved relationships, to a greater willingness to take on domestic work and lower rates of sexual harassment and violence against women. The results of eight, mostly quasi-experimental studies on Program H around the world have found evidence of positive changes among program participants: from more gender-equitable attitudes and behaviors generally, to improved couple communication, reduced gender-based violence, and improved attitudes around caregiving. Program H has been used to tackle a variety of sexual and reproductive health-related issues including shared contraceptive decision-making, stigma and discrimination against people living with HIV and AIDS, condom use, and sexual health-seeking behavior, among others. Most recently, the U.S. adaptation of Program H called Manhood 2.0 was implemented and evaluated as a teen pregnancy prevention program. Past evaluations of Program H have shown increases in self-reported condom use, decreases in self-reported STI symptoms, and more positive attitudes towards people living with HIV. Program H has been named a best practice in promoting gender equality and preventing gender-based violence by the World Bank and the World Health Organization and has been cited by UNICEF and the United Nations for its effectiveness. It has also been commended by the Pan-American Health Organization, UNDP, and UNFPA. It has been officially adopted by ministries of health in Brazil, Mexico, Chile, and Croatia, among other countries. Recognizing the need to work with and empower young women alongside men, and based on input from female partners of Program H participants, Promundo and partners launched Program M in 2006. Named for mulheres and mujeres, the words for women in Portuguese and Spanish, Program M engages young women in similar critical reflection about gender norms and empowerment. Promundo and partners recommend using the two approaches together and including specific discussions on sexual diversity and homophobia. Although adapted across many settings, schools have long been a central implementation setting for Program H as well as Program M, providing supportive structural environments through which the approach can be scaled up institutionally. In Brazil, Promundo has launched the Portal for Gender Equality in Schools to train teachers on the Program H and Program M methodologies through an online course, while in India, Program H approaches have been taken up by the government and rolled out in over 25,000 schools. 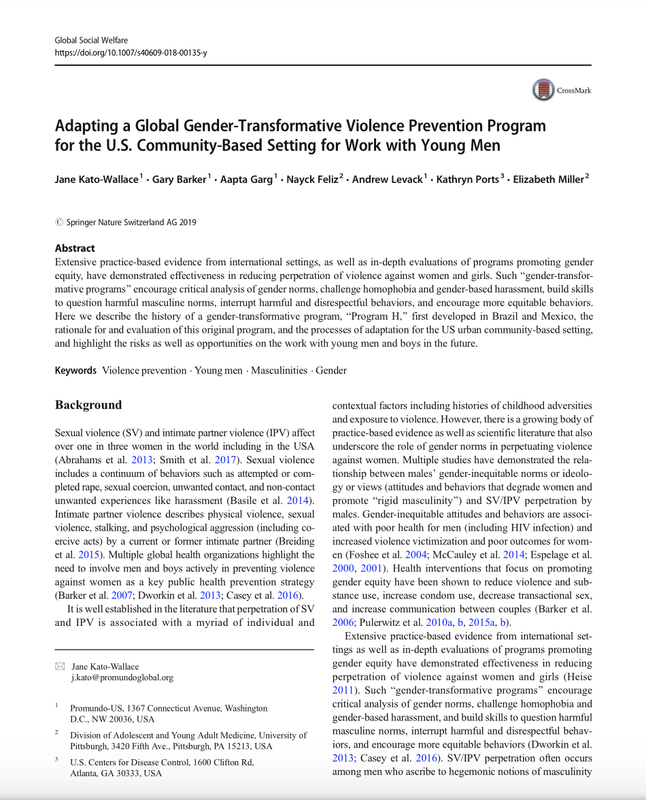 Recent adaptations of Program H include Programme Ra and Manhood 2.0 in 2016. Programme Ra is the first-ever Program H adaptation in the Middle East and North Africa (MENA) region, working with young men from refugee and marginalized host communities on topics of gender equality, nonviolence, sexual and reproductive health and rights (SRHR), and substance abuse. Developed for young men in the United States, Manhood 2.0 is a gender-transformative curriculum and community-based program designed to engage men in challenging harmful gender norms and reducing sexual violence and dating/relationship abuse. Program M: Designed for young women, Program M focuses on equitable gender roles, empowerment in interpersonal relationships, and sexual and reproductive health and rights. Program D: Designed for use with Program H and Program M, Program D combats homophobia and promotes diversity. Manhood 2.0: Adapted from Program H, Manhood 2.0 is a gender-transformative initiative to engage adolescent boys and young men in reflecting on harmful gender norms in the United States. Portal for Gender Equality in Schools (PEGE): PEGE offers online training for teachers around changing gender norms in the classroom.